"Even if you don't have a lot of time to spend getting dinner together, you can still charm your family with this clever meal idea. 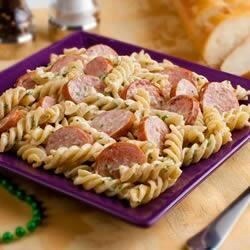 In less time than it takes the fusilli to cook, you can conjure up a spicy Alfredo sauce with blackened Smoked Sausage. When the pasta is done, just toss with the sauce. It's pure magic." While pasta is cooking, cut sausage into 1/4-inch slices. Place in bowl and sprinkle with seasoning; toss lightly to evenly coat. Heat a large skillet over medium-high heat for 3 minutes. Add sausage; cook and stir for 3-4 minutes or until lightly browned. Stir in Alfredo sauce, parsley and hot sauce to taste; heat through. Pour over pasta and toss until well coated. Serve immediately. Very good. I managed to get it way too spicy though. Next time, I'll go a little easier on the creole seasoning. I'm definitely going to try this again. This recipe did not work out for our family. I first I was a little skeptical about the combination but it was really good. Instead of fusilli pasta, I used tortellini with cheese. Overall, it was very good.